And, yes, lime light was used to spotlight solo performers in theatres, the first being Covent Garden Theatre in London, which is the origin of "being in the limelight". To control brightness a man with an airbag would push harder or softer to make the lime burn brighter or softer as the scene required. This worked fairly well until a troupe of dance hall girls entered stage right and the limelighter would, shall we say, freeze, which exposed the light source's imitations. It soon became clear that some form of automation was needed to more reliably regulate lighting, so Mr Beard took it upon himself to switch to an alternative source and invent controllable gas lighting. The upshot is that Photon Beard has been making, controlling, and advancing the technology of lighting fixtures ever since. After 133 years of making lights that work, Photon Beard did not feel immediate pressure to jump into making LEDs that, initially, didn't work, or at least not very well. Many early LED adopters soon found themselves with piles of lighting fixtures that simply didn't do what they said on the box, a shortcoming that in some cases was total in that they provided no light at all. We were among the first to start experimenting with LED and our early working prototype was an optically nice unit but these early efforts required a size and associated cost that ultimately ruled out LEDs as a viable product for professional applications. 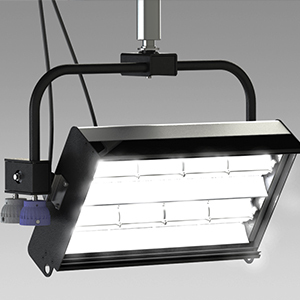 That said, we soon turned to exploring other lighting technologies such as plasma, and eventually produced a near full spectrum, highly efficient spotlight called the Nova 270, which won many awards for innovation in 2013 and 2014. It was, and is, a great light and deserved every award it received, but as can often be the case with new, better ideas, the final product was so expensive to produce that it proved not to be commercially viable. Circling back to my point, what exactly was wrong with LED? I should start by mentioning that LEDs and, indeed, fluorescent lights give us "white" light, but the energy source that generates it is actually a narrow wavelength blue light. In fluorescent lighting, this is achieved by a discharge source rather like a hydragarum medium-arc iodide (HMI), which is a fancy pants way of saying "liquid silver". Fluorescent tubes can be made to high CRI or near full spectrum standards, and the phosphors are mixed in a relatively large space - the coating of the tube - so getting repeatability and accuracy was easy. However, in LED's the space is much more confined, which makes it very difficult to get the phosphor mix right. This meant that each LED had to be tested, measured, and "binned" (i.e., categorised) based on individual output. That's why you will hear people talking about specific bin numbers, i.e., "Get me the LEDs from bin 10 as they are the output specification I need." The problem is that the wide tolerances of some bins had so much variance that even lights from the same bin number could be wildly different in output. There was, and in some cases still is, a great deal of inconsistency. Today, the technology that many are finding extremely useful, and that we have tried, tested, and adopted ourselves to provide high quality, near full spectrum light, is Remote Phosphor LED. What we've done is house very narrow wavelength blue LEDs on one side of a "mixing chamber". Very close to the front of that chamber is a plate that holds the phosphors and emits the light. Because the phosphors are now applied to a larger area we can be far more accurate and consistent when mixing the coating, which enables us to be confident that the light from each set of remote phosphor LEDs is consistent and will perform exactly as claimed. Although, as I said, remote phosphor technology has been adopted by Photon Beard, and a few other manufacturers, we continued to press on to find a better way. Most, if not all remote phosphor LED fixtures produce bright, high quality light but - and this is important - without direction. Lack of direction is fine to light an entire football pitch or studio, but most end users need to be able to control the light to ensure it hits the "right" spot, not the spot next to it, or even the one on the other side of the studio. So, what's our answer? Our answer is "Highlight LED", which features an optical arrangement proprietary to Photon Beard that gives shape and direction to LED light by gathering the wide, directionless output to send it out in a far more limited, and useful, 60-degree arc. The benefit of this is that the user gets far more light where they actually need it, and in many cases for 30 percent less energy than what would be required from similar lighting fixtures. Air bags and dance hall girls not included.